First Presbyterian Church helps to sponsor two missionaries in Dhaka, Bangladesh, through the General Assembly Mission Council of the Presbyterian Church (U.S.A.). They are Les and Cindy Morgan. Les and Cindy have been serving as missionaries for the PC(USA) in Bangladesh since 1989. After serving three years at the Christian Health and Agricultural Project in Ahladipur (CHAPA), they joined as health advisors for the Church of Bangladesh (COB) and were stationed at Christian Mission Hospital (CMH) in Rajshahi for 13 and a half years. 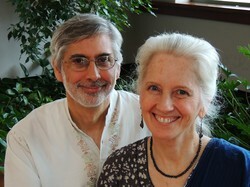 In August 2006, the Morgans relocated to the capital city of Dhaka, where they serve as advisors for the Church of Bangladesh health ministries. The Morgans continue to serve at Christian Mission Hospital, traveling back and forth to Rajshahi once or twice a month. CMH is an 80-bed facility that serves Muslims, Hindus and Christians from the greater Rajshahi area. Patients come to CMH because of its reputation for compassionate care for the sick. The hospital’s nursing school has a four-year training course with 60 students who are learning to serve the sick in Christ’s name. At CMH, the Morgans serve primarily as advisors to the new director, Dr. Andrew Roy, and they continue to help shape and support the hospital’s primary health care program that reaches out to serve the marginalized tribal people in the rural areas of the district. In Dhaka, the Morgans run clinics in several of the Church of Bangladesh’s Christian Ministry to Youth and Children (CMCY) program areas, and are helping to further develop community health outreach in other COB programs. The Church of Bangladesh has also recruited their participation in retreat leadership and to assist in leading the English-language worship on Friday mornings. Les was born in New Orleans and raised in Shreveport, Louisiana. He earned his B.A. in biology from Colby College in Waterville, Maine, and his M.D. from the Louisiana State University School of Medicine in Shreveport. He later earned an M.T.S. in biblical studies at Harvard Divinity School in Cambridge, Massachusetts, and an M.P.H. in international health from the Johns Hopkins School of Public Health in Baltimore, Maryland. He is certified by the American Board of Internal Medicine. Cindy was born in Lake Charles, Louisiana, and grew up traveling throughout the southern United States and Europe with her Air Force family. She received a B.S. in zoology from Northwestern State University of Louisiana in Natchitoches, her M.D. from the Louisiana State University School of Medicine in Shreveport and an M.P.H. in international health from the Johns Hopkins School of Public Health. She is certified by the American Board of Preventive Medicine. Cindy has been enrolled in the Certificate in Spiritual Formation program at Columbia Theological Seminary since 2005, and completed the Diploma in the Art of Spiritual Direction program at the San Francisco Theological Seminary in May 2009. She is ordained to the office of elder in the PC(USA).